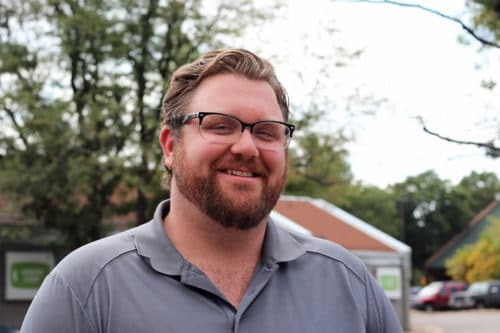 Brewers | Boulder Brewery | The Post Brewing Co.
Nick grew up in Mystic, Connecticut and studied music at Eastern Connecticut State University. Wanting a change in scenery, he traded ocean for mountains and moved out to Colorado. He has always loved beer—both enjoying and brewing it—having started homebrewing with his dad at a young age. Since joining the brewing team at The Post in April 2014, Nick has experienced everything from sales to brewing and beer analysis. When he’s not at The POST, you’ll find Nick playing or enjoying live music, exercising with his dog or not exercising with his cat. For the past five year’s he’s ranked #1 in the Big Red F’s “Best Looking 60 under 60 years old” competition. Brad first fell in love with beer in his hometown of Kalamazoo, MI—home of Bell’s Brewery—and started home brewing at the age of 20 when he realized that he could legally buy all the ingredients needed to make his own. After graduating from Western Michigan University, he moved to Colorado to pursue a career as a travel director, coordinating corporate trips around the world and working at multiple Olympic games and PGA events. In 2009, he turned his passion for beer into a profession and joined the crew at Wynkoop Brewing, where he quickly rose through the ranks. He’s since lent his talents—as lead brewer—to both Mountain Sun and Prost Brewing, winning four medals at the Great American Beer Festival along the way. In the summer of 2017, he joined family at The Post Brewing Co. and boy are we glad that he did! Even when he’s not brewing, Brad spends about 90% of his time talking about beer. 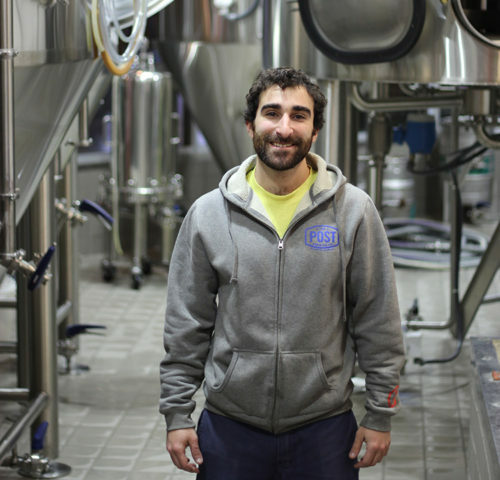 He believes a good brew has the power to turn new acquaintances into brothers and sisters, and feels truly blessed to be around beer all the time. He also enjoys hanging out with his wife Stacey and their adorable mutt Lucy, skiing, camping, watching the Detroit Lions figure out a new way to lose, and smoking meat in the backyard. In fact, his team took 10th place (out of 103) at the 2017 Memphis in May BBQ competition! Jess started home brewing with her husband in 2010 during the great IBU arms race of IPAs. At the time, she couldn’t find Dogfish Head Indian Brown (in Delaware!) and New Belgium hadn’t made it to the East Coast yet, but she wanted to drink ambers, porters, and stouts, damn it! 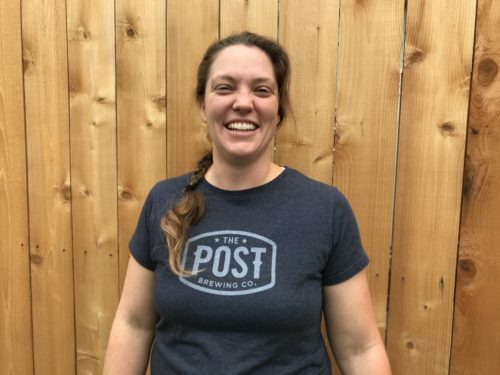 She quickly found out that her education and experience in biotech (for which she earned a Master’s from VA Tech) were both applicable to brewing, and that she wasn’t half bad at making a home brew. She fell in love with the process (and results) of brewing, and decided to put it all on the line and become a professional brewer. After enrolling in the Master Brewer’s program at UC Davis, she chanced upon a YouTube video of The Post Brewing Co. and made her way to Lafayette, CO, to make her dreams come true. A heck of a brewer, Jess completely dispels the stereotype of the “mad” scientist—she loves her job, and her positive attitude and passion for both chemistry and brewing are contagious. When she’s not nerding out about the challenge of harnessing a temperamental single celled organism (yeast) to make delicious beer, or discussing the finer points of the Crabtree Effect (which governs yeast metabolism), Jess enjoys hiking, working on house remodeling projects, home brewing, failing at negotiating with her toddler, and volunteering her husband for honey-do lists and community events. Karl’s love affair with craft beer began with a growler from the old Walnut Brewery. He can’t remember what kind he had, just that it put everything else in the rearview mirror. Born and raised in Little Rock, AR, he made his way out West to play varsity football at CU, winning a conference championship and two division titles in his time on the team. After school, he basically became a lifer of the beverage industry, with stints in bar management, wine & spirits wholesaling, and craft beer. 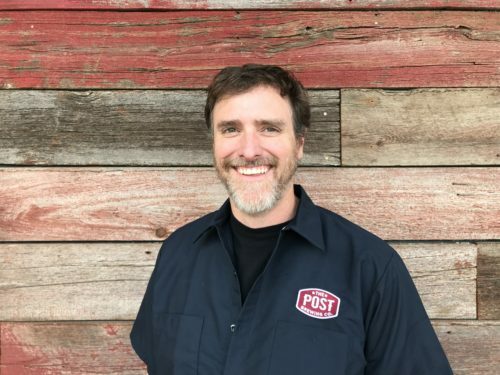 As an enthusiast for both beer and fowl, he’s had The Post on his radar since they first opened their doors and jumped at the chance to join the team. Karl—aka Hungus— is known for his quick wit, exemplary customer service, zest for trivial knowledge, and always carrying around his trusty can sling. He loves bringing good people together for a common cause, even if it’s just a post-work beer, and believes that, in the grand scheme of things, American craft beer is still very young and we are all ambassadors of the cause. When he’s not waxing poetic about The Post, you’ll find Karl with his friends and family, exploring the great outdoors, watching a game, hosting a dinner party, or watching his favorite movie, The Big Lebowski, for the thousandth time. He is also bona fide benefit auctioneer, always looking to put his services to good use and help raise funds for a worthy cause.